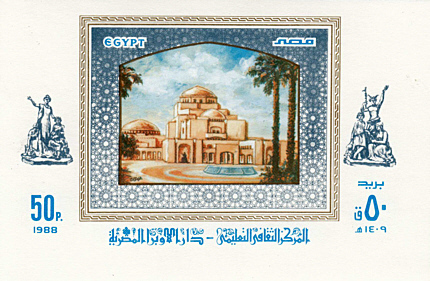 Built 1985-1988 by a team of Japanese and Egyptian architects on the former site of the Gezira Exhibition Grounds, funded by a grant from the government of Japan. Opened 10 Oct 1988. Official name "Centre for Education and Culture". The complex includes three theatres: the main hall (used for opera and ballet performances and classical concerts; 1200 seats), a small hall (used for film festivals, conferences, and other events; 500 seats), and an open-air theatre (mainly used for popular concerts; 600 seats). The complex also includes several art galleries, a music library and an opera museum. The complex is home to the Cairo Symphony Orchestra, the Cairo Ballet Company, the Cairo Opera Company, the Cairo Opera Choir, and the National Arabic Music Ensemble. 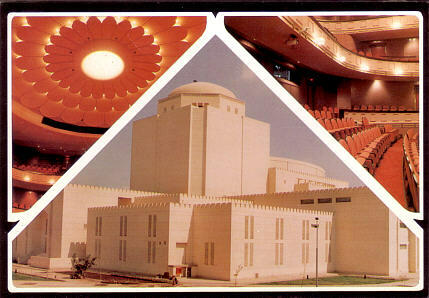 Reverse Text: "Education & Culture Centre - Opera House"